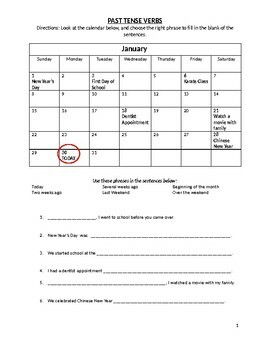 Most children learn to use the past-tense with the sentence prompt, "Yesterday, (subject) (past-tense) verb." There are many instances where we need to use the past-tense, and "yesterday," is only one of those instances. 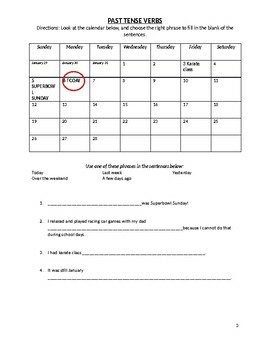 In order to develop better temporal clause usage and knowledge with one of my clients, I created these "calendar" worksheets, where there are events listed on the calendar, a set section of phrases to use in fill-in-the-blank sentences. 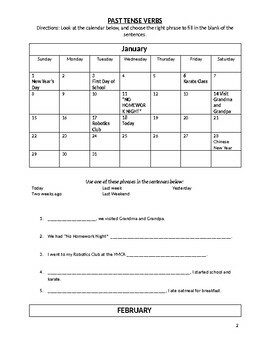 Feel free to use download, and edit the calendar and phrases and sentences used as needed. 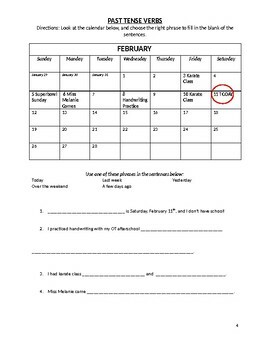 You can even extend this to future tense as well! It is up to you.